I make no apology for, once again, asking people to vote for me. Putting yourself up for election is a fairly egotistical thing to do, as is having an eponymous blog. And although I’ve never introduced myself on the doorstep (my patter is to call “on behalf of the Conservatives” rather than putting a particular name forward) I have no shame in promoting myself as the best choice for Shaftesbury for the next four years. But I’m actually not quite that egotistical. I think you should vote for some others as well. Jane Ellison has been working hard for years and will make an excellent MP for Battersea and give it the voice it deserves. And for the council Guy Senior has represented Shaftesbury for longer than me (since 1990) and worked hard to help keep Wandsworth providing value and excellent services. Finally, Jonathan Cook will make an superb addition to the team, he’s already been around, introducing himself to all and sundry and will make a great councillor. 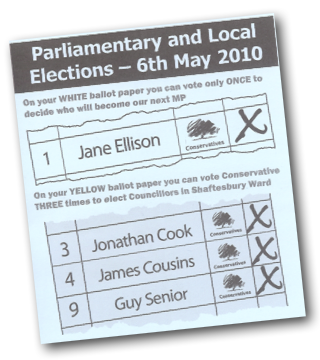 Remember, ONE vote on the white paper for Jane ELLISON and THREE votes on the yellow paper for Jonathan COOK, James COUSINS and Guy SENIOR. We will all have the Conservative tree logo by our names. I’m not sure if I will be blogging during the day, I hope to post a few bits and pieces from out and about, but I also know that it’s going to be an incredibly busy and long day – we shall see what it brings. Why should we trust any of you ? You are all lying scumbags, be it liberal, labour, conservative. Thank-you for your opinion, thankfully most people did not share it.